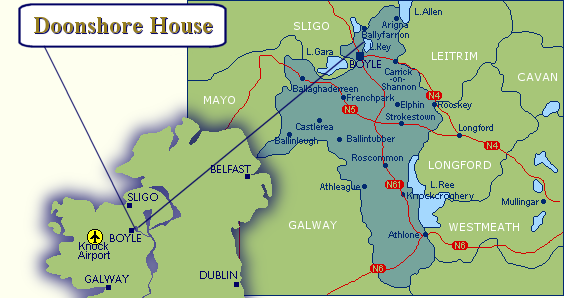 Doonshore House apartments are located on the shores of beautiful Lough Key (200km of exquisite waterways offering perfect fishing) and only 4km from the town of Boyle, Co. Roscommon. To get to us, travel 2km from Boyle towards Sligo on the N4 National Primary Route. Turn sharp right on to the Ballyfarnon road. 2km further on the right hand side of the road, and in plain view of Lough Key, watch for a signpost pointing to Doonshore House. A warm welcome awaits you! From the private mooring at Doon Shore House, one has access to more than 700km of rivers, lakes and canals. 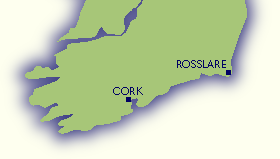 For boating people, anglers, archaeologists and nature lovers, Ireland's inland waterways offer unmatched space, solitude and beauty. Lough Key offers a constant visual feast, with its 32 wooded islands, birds, fish, lakeside and water flowers. Visitors will be delighted with its wealth of mystical and historical legends. Perfect accommodation for fishing and angling in Lough Key, Boyle Northern Roscommon, Republic of Ireland (Eire).